San Jose Mayor Sam Liccardo says he's been in talks with an Elon Musk subsidiary about the possibility of building a tunnel to link the city's airport to its main transit terminal — a project he sees as vital to the city's transportation system for decades to come. In a memo to the San Jose City Council released Tuesday, Liccardo said he reached out 18 months ago to The Boring Company, the Tesla founder's tunnel-construction firm, about the potential for boring a tunnel between San Jose International Airport and the Diridon Station area 2 miles away. Liccardo said such a tunnel could serve a long list of the city's transportation goals. The project would provide better access to the nation's fastest-growing airport, he said, and be an important step in turning Diridon into the region's "Grand Central Station" for the next century. "If we're building this station not just for the next few years but for the next several generations, we want a station that will be able to grow with the city," Liccardo said Tuesday at a media briefing before a City Council meeting. 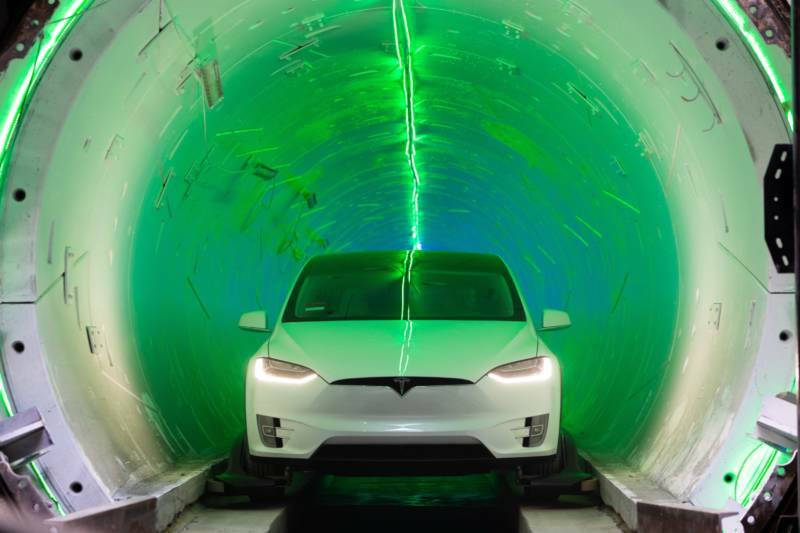 The mayor said he initiated conversations with Musk's tunneling firm because he's looking for cheaper alternatives for building a connection between downtown and the airport. Prior projections for an airport-downtown rail line have estimated the project would cost $800 million — a figure Liccardo said was likely too low. The mayor said that he hopes to get buy-in from councilmembers to allow city staff to begin a more formal exploration of the concept. And though he mentioned only Musk's company by name, he said this was a chance for the city to entertain ideas from a range of firms developing new transportation technology, including autonomous vehicles. "This is an opportunity for us to move forward with an exploration of some of those other technologies and really offer companies throughout the globe a chance to show off what they can do in the heart of Silicon Valley," Liccardo said. The mayor added that one of the city's aims in opening discussions with The Boring Company is to assess whether the technology the firm is promoting "is real or not." The company is "still in what you might call experimental stages," Liccardo said. "They don't yet have a transit system. They're merely boring tunnels. I know they have one (in Southern California) which is promising, but by no means does that a transit system make." Musk and The Boring Company have touted their tunnel construction approach as much faster and much less expensive than conventional tunnels. But as Liccardo suggested, the biggest question surrounding that vision is whether the The Boring Company — a project Musk said he dreamed up because he was fed up with L.A. traffic — can deliver. The company has promised to dramatically speed up the construction of tunnels and cut their expense — using industry-standard technology, they can cost $1 billion a mile or more — by both developing new technology and adopting a new approach to the tunneling challenge. The company's proposed tunnels — like its 1.4-mile test bore in the Los Angeles suburb of Hawthorne — are less than half the diameter of a "standard" 28-foot tunnel. That in itself could dramatically reduce tunneling costs. The firm is also devising more powerful, electrically driven tunneling machines that speed up construction by simultaneously boring ahead and building tunnel walls. Once tunnels are completed and ready for use, the company envisions a system its calling "Loop." It would employ electric vehicles called skates to carry either individual cars — Teslas, of course — or pods that could carry eight to 16 people. The company envisions skates that would be lowered from street level, then traveling through tunnels at up to 150 mph before rising back to the street at the end of the line. Loop systems have been proposed for Los Angeles, Chicago and the Washington, D.C. area. But how close are they to arriving in any of those places, let alone downtown San Jose? On one level, the company practically vows to alter the fabric of reality with its futuristic vision of ending, or at least escaping, surface traffic gridlock. On the other hand, all it really has to show the public so far is a 40 mph ride in a Tesla Model X through a bumpy test tunnel tricked out with garish (i.e., futuristic) lighting. Of course, seeing is believing. The company's currently planned Los Angeles Loop project involves a short run from a stop on the L.A. Metro's Red Line to Dodger Stadium (the exact alignment hasn't been decided yet). An official with the Dodgers said last summer the new system, dubbed the Dugout Loop, would be ready "in time for the 2020 season." San Jose, with its increasing congestion, will be watching. "Certainly our city isn't going to get any less crowded, and God's not creating any more land," Liccardo said Tuesday. "So it is likely that if there's going to be a viable (downtown-airport) connection, it's going to be underground."